There were some independent items worth noting in the California manufacturing employment narrative this week. First the California Labor Market Information Department, in its monthly report this week, announced the loss of 1,600 manufacturing jobs in March. This decline brings California’s manufacturing jobs growth to 3.4 percent since the recession, while the U.S. grew its manufacturing base by 7.4 percent. In the same week came an announcement from a southern California manufacturer, General Magnaplate, who said they would be shutting down their manufacturing facility in Ventura because of a difficult business climate and an unwarranted stormwater lawsuit against them. Magnaplate is a small manufacturer with only around 25 workers in their Ventura facility, but that means nothing to their employees who are left looking for work. The good news is that families in Texas and New Jersey will likely gain employment because the company’s facilities in those locations will pick up production. Just one example of the drips of manufacturing loss accumulating over the years in California. Basically the AEE report tells us that if you raise prices on something you can get more people working on ways to reduce consumption. That is of course not a surprise. But when it comes to the entire economy, our collective data is telling us that our state is still lagging the country in manufacturing jobs and investment growth. Update on MFG jobs vs the U.S. The Bureau of Labor Statistics and California's Employment Development Department recently made their annual revisions to employment data. 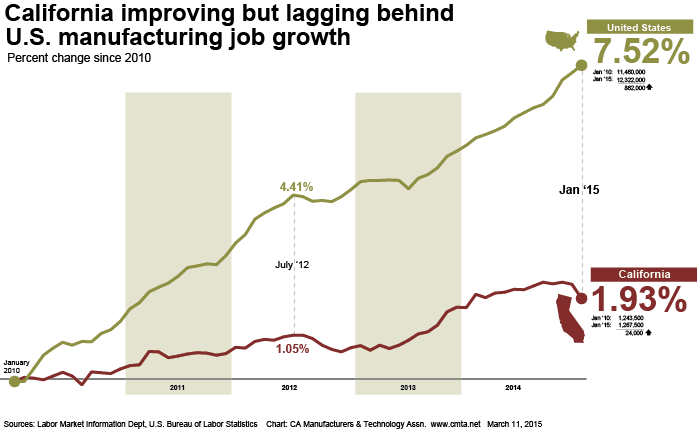 California manufacturing still lags behind the country in manufacturing job growth since the recession, though the state did see a little bump comparatively to the country. On the month-to-month front, California lost 4,200 manufacturing jobs in January. We ask you, is this reaching California's potential? Are we comfortable with this direction? The manufacturing renaissance is a tremendous moment of opportunity for California to leverage and grow opportunities for its middle class working families. As stated in this great National Association of Manufacturers video, "Nothing happens unless we hit that start button." Last week we looked at recent investment levels of manufacturing across the country and found that California is still lagging the country in the ever-important category of new and expanded facilities. This week we took a look at the state's manufacturing employment levels since 2000 versus the country. The California trend continues with a larger percentage loss than the rest of the United States.